Le Manoir Aux Quat’Saisons and its gardens are the realisation of 30 years of passion and hard work by Raymond Blanc and his remarkable staff. To mark the anniversary he commissioned me to produce a definitive aerial view of Le Manoir. I confess to being slightly intimidated on my first visits. It was clearly a place driven by the pursuit of pleasurable excellence: something that cannot be achieved without stretching and surprising oneself. In order to capture its spirit aswell as its likeness, I would have to do precisely that. The main difficulty was how fast the gardens evolved. It seemed they were changing more quickly than I could capture them on paper. Between visits new glasshouses would appear, new paths would unravel through new beds, whole orchards would spring out of the soil. Despite being planned with precision, the gardens seem to grow and flourish as organically as the produce within them. But, working closely with RB and Head Gardener Anne Marie Owens over a period of eighteen months, we wrestled it into shape through a series of sketches and increasingly elaborate working drawings. The moment came to commit it to paint. This involved starting with loose, pale washes on hot-pressed Arches paper before building up increasingly detailed watercolour layers: growing the garden and buildings ‘from the ground up’ as it were. After the painted layers were complete, the fine details and lettering were worked into them with .13 Rotring Isograph pens in sepia and red inks. The main technical difficulty involved ensuring that every corner of the garden at ground level was visible. Even the tallest, densest trees needed to remain translucent. It’s always hard to feel proud of a piece of work but, in this instance, I feel I came as close as possible to doing justice to both place AND its raison d’etre. It was a privilege to work at Le Manoir, and an edifying hoot to be be around such talented, focused people. If you ever get the chance to go there, DO. 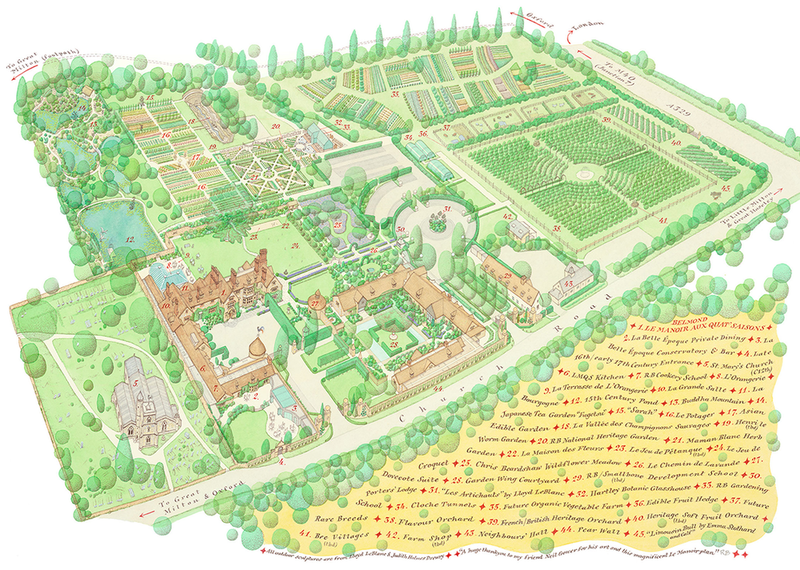 And do use my map to make sure you don’t get lost in the glorious profusion of potagers and parterres.